A water lover's dream! Spectacular views of water on both sides of the condo! This condo is the ultimate family vacation spot! One of only a few units in Windjammer with two balconies, every bedroom opens to a balcony, one overlooking the Atlantic Ocean and another the Intracoastal Waterway, with each balcony having a table and four chairs. Have breakfast on the Intracoastal Waterway balcony and watch the parade of yachts, sailboats, fishing boats, and jet-skis. Or enjoy the view of the pool from your balcony as you sip cocktails and relish the spectacular sunset. Or stay in your pajamas and relax on your private, ocean-side balcony off the master bedroom. Swaying sea oats with butterflies, seabirds, turtles, and rabbits will entertain you as you watch the waves of the ocean and are calmed by the peaceful sounds that only the ocean can provide. With the white sands of Crescent Beach to lure you and the private Windjammer fishing dock, tennis courts, and historic St. Augustine and its sites to attract you, it will be difficult to stay inside the condo! But inside you will find a large kitchen with an island, glass-top stove, all-new stainless steel appliances, granite countertops with sparkling blue flecks, and a stunning glass-tile backsplash. You’ll want to sleep late in the comfortable king-size bed in the Master bedroom or maybe watch a movie on the new wall-mounted 32” Samsung flat-screen HDTV. The kids will have their DVD player in their bedroom to watch movies - equipped with two full beds - all with new, top quality mattresses. The third bedroom, with a queen bed, is beautifully furnished with all-new furniture and with an elegant beach theme and artwork. Not interested in artwork? Make your way to the living room to catch up on your latest shows. The unit sleeps eight in real beds - no sleep couches or blow-up beds! After sunbathing, surfing, boogie boarding, playing in the sand, flying kites, fishing, walking the beach, playing tennis, swimming in the pool, or visiting the historic sites you’ll be tired - so curl up on the cozy, slipcovered Pottery Barn couch and watch the 46” Sony flat-screen HDTV for some restful downtime. Slip away for a quiet bath by candlelight in the big, lounging bathtub. This is beauty and beach at its best. There is so much to do in St. Augustine and at Windjammer you’ll want to come back! Mold in bathrooms from leaking shower. TV could not turn it on from original device. Did not have a view, but knew that from pictures. Hi Sally, thank you for choosing to stay with us and taking the time to post your review. Our local office has been made aware of the issues you have mentioned an is sending someone out to inspect as soon as possible so we may take the appropriate action. Your patience as we worked to get the TV issue resolved was greatly appriciated. Although this unit did not meet your expectations upon arrival, we do hope you continue to book with us in the fututre. I rented the property assuming it had an obstructed view. It had no view. The pictures of the view in the listing had to have been taken standing on a chair. Only the dune and the thinnest sliver of ocean is visible from the deck and living room windows. You have to stay on the second floor or above at this property to see the ocean and beach. There are TVs in every bedroom but only the master had cable which was a major issue for our group and a surprisingly cheap decision on the part of the owner considering the weekly rental is about $2500 and a cable box is $10 per month. Overall the condo was OK but over priced. I would not book it again and I will avoid VTrips, the property manager, because they would not make it right. We truly appreciate your feedback regarding your recent stay. We apologize if the accommodations did not meet your standards as we work diligently to provide our guests with a pleasurable vacationing rental experience. Per our property descriptions, it is notated that the TV's in the other bedrooms, not including the living room or the master, have DVD players for added entertainment. Still understanding your frustration and discontent, we have made additional efforts to make sure that guests are aware of the property features. For any miscommunication on our end, we truly are sorry and would relish the opportunity to make it up to you. Although this may not make up for any lost time, we would still like to extend to you 10% off your next vacation rental. It is our hope that this will be a great start to regaining your trust. Again, we would like to thank you for sharing your comments and we hope to host you once more in the near future. Condo was quite nice. Kitchen was well equipped. Could have improved on the cleanliness in the kitchen area. Spills on the appliances and cabinets. The toaster oven was pretty old and nasty and the toaster was not usable!! Toaster was rusty inside and needs to be replaced! Just FRI, we had a few issues with the cook top. It did not want to turn off several times and may need some maintenance. Also, the floors were a bit sandy. We had to vacuum when we arrived and had to purchase a broom as there was not one at the condo. Bathrooms were clean, beds were comfortable and it was nice to have beds made and towels provided. Washer and Dryer worked well. The laundry soap drawer on the washer was broken. We enjoyed the deck areas, especially overlooking the ocean. Great to have close access to the ocean and we really loved having a pool. pool was kept very clean!! In general this was a nice condo and we had a great vacation. OVERALL 4 STARS. BEAUTIFUL LOCATION. NICE OPEN ROOM LAYOUT. GENERALLY, WHEN ON VACATION WE ARE OUT AND ABOUT 90% OF THE TIME FISHING, BEACHING, AND SIGHT SEEING. YOU CAN FISH ON THE BEACH (FOR WHITING, RED'S, BLACK DRUM, LADY FISH, AND OTHER SEASONAL FISH SPECIES) OR FISH ACROSS THE STREET ON THEIR PRIVATE AND LIGHTED DOCK WHICH WAS EQUIPPED WITH RUNNING WATER, A SINK AND CLEANING STATION AND ROD HOLDERS. I WOULD GIVE 5 STARS IF A FEW THINGS WERE ADDRESSED. APPEARS MOST APPLIANCES WERE UPDATED EXCEPT THE TOASTER AND COFFEE MAKER...BOTH NEED REPLACED.THE TOASTER IS HARD TO USE, HANDLE STICKS AND WONT COME UP WHEN DONE. THE COFEE MAKER WORKS BUT THE WORDING ON THE UNIT IS WORN OFF SO YOU'LL HAVE TO FIGURE OUT HOW TO USE IT AND WHAT EACH BUTTON DOES TO PROGRAM IT. OTHER THINGS THAT NEEDED ATTENTION ARE THE MASTER BEDROOMS' KING SIZED BED MATTRESS. IT IS JUST TOO FIRM. SO IS THE 2ND BEDROOMS'. THE 3RD BEDROOM WITH THE TWIN MATTRESS WAS COMFORTABLE. I WOULD STILL RECOMMEND RENTING THIS UNIT AND WOULD HOPE THESE THINGS ARE ADDRESSED B4 NEXT YEAR. We want to thank you for taking the time to write us this extremely helpful review of your stay. We are happy to hear that you loved the layout, the location, and has a wonderful time fishing! Please know, we are working diligently on the issues that you have addressed for us. We are sending out one of our property inspectors to take a look at the appliances that you have mentioned and to test the beds in both bedrooms that you have mentioned. We are happy to hear that you would recommend this unit. We appreciate your feedback and honesty and hope that you continue to book with us. We stayed at this condo development last year for two weeks and it was great. Decided to visit again for a month this year and were extremely disappointed. The condo management and the rental agent had no idea what the other was doing. Day 1 we realized there was no longer access to the beach. The stairs at the end of the walkway had been washed away so rather than temporarily replacing them (apparently they are waiting for DNR approval to reconfigure them), the walk was nailed shut. Access to the beach was by walking to the development next door and going around their building to their walkway (really convenient with beach chairs, towels, books, drinks, toys AND 2 yr olds). Ok, at least there’s a pool - NOPE, day 3 the pool was drained for retiling and repainting - took 2-1/2 weeks. The exterior was being repainted the entire month we were there. Scaffolding, cherry pickers, etc. And then the drilling and hammering began. For 2 weeks we were awakened to the sound of jackhammers, drills and hammers - the garage was having New supports installed - this started between 7-8 am each morning. It was so loud you couldn’t turn up your tv loud enough to drown out the sound. So let’s see...no beach, pool or ability to spend a quiet morning in your own place. The condo management said they told the rental agency, the rental agency claimed they were never told....on and on...( the rental agency did refund 10% of our cost - not nearly enough but at least something). We love the St Augustine area but would never stay at this development again - there was no reason to have all of these projects going on at one time. If the condo associations purpose is to deter renters, they succeeded... 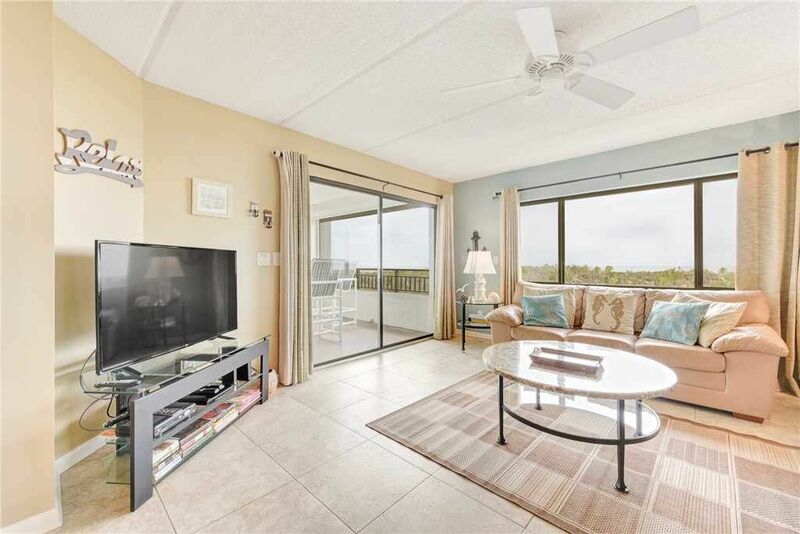 The unit itself, while needing a seriously deep cleaning, was a great size and has beautiful balconies, one overlooking the ocean and one overlooking the Matanzas River. The actual owner is very nice also and was extremely apologetic about all of the issues. We were disappointed to hear of your recent vacation troubles during your stay at our property. We apologize for the inconveniences that you had to endure as this was not our intent. Any miscommunication or misunderstandings on our end, we truly apologize and hope that you were able to still enjoy your time in St. Augustine and the amazing ocean views from the balcony. We understand your frustrations as this is not how anyone's vacation should be and we appreciate you giving us the opportunity to make things right for you. We know we may not be able to replenish lost time, but we were glad that a partial refund was able to take place. There is clearly something that we are missing as we strive to better the overall vacationing rental experience. We have urged the Condo Association to keep us informed and communicated the importance of transparency. Reevaluations of our current systems and processes are in place so guests are aware if issues such as this should arise again. Thank you for your patience and taking the time to share your concerns. We definitely acknowledge and sympathize with your discontentment and can only aspire to regain your trust and hope that you will consider staying with us again in the future. This would have been a 5 star except for the construction work going on during the week that did not allow us to have doors out to the beach open during the day was very disappointing. The condo is nicely updated. We cooked Thanksgiving dinner there using a very nice and well stocked kitchen. The views of both the beach and the intercostal were breathtaking. Overall wonderful experience except for the noise, dust, and construction.